In this post we are following on our conversation with showcased artist Tom Estes digging into his choices to shift his practice from video and installation to photography, performance and ‘virtual dimensions’. Tom talks about his artwork Overlords as well as the process and the reasons that have led him to undergo such a dematerialization of his practice. Overlords at The 54th Venice Biennale. More info here. AF: In 2011, you participated to the Basel exhibition of The Agency of Unrealized Projects, an e-flux ongoing project realized in collaboration with the Serpentine Gallery. The work you exhibited here, Overlords, was also exhibited at the 54 Venice Biennale. Can you tell us more about this work? how the exhibition took place, what kind of format it had and what kind of works were exhibited alongside Overlords? TE: The work was inspired by the recent diagnosis by some analysts that the economy has become distorted in favour of the super-rich. It has been argued that what we are witnessing is not a single economy at all, but rather the emergence of two, increasingly distinct and divergent types of economy. By referencing the laws of Quantum Mechanics I make reference to the co-existence of several possibilities at the same time- such as two distinct economies existing side by side, or of an installation in real space being presented in cyber space. I wanted to highlight the nature of digital photography and its relationship to both the virtual and the real space. 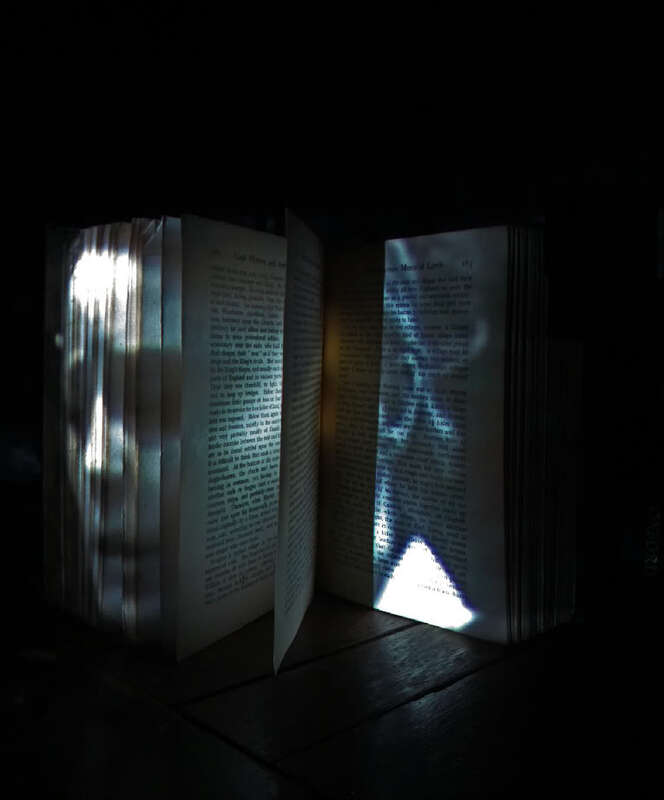 So the creation of Overlords started out as a video installation comprised of images of ‘Time Travel’ projected on to a book called Local History and Antiquities. Overlords was amongst the winners of the Boston Biennial and I was then invited to show the work at The 54th Venice Biennale at the VIP opening reception organised by the Biennial Project. Art Basel and The Venice Biennale are two of the most important dates in the art calendar and a meeting place for super-rich art collectors. So I felt both of these venues were an ideal context in which to show Overlords. AF: Can you tell us something about The Agency of Unrealized Projects? How the exhibition took place, what kind of format it had and what kind of works were exhibited alongside Overlords? The Agency of Unrealized Projects is really an archive. In Basel, it was in a funny little space that was outside of the main art fair and it seemed to be the place where everyone went to party – all the artists and the cool people hung out there. It wasn’t really an exhibition in the sense most people think of with paintings in a white cube space. It was part of an archive, in which people could see a selection of its contents. EA: Your work was showed there because it is considered an unrealized project. How do you see your work in relation to the exhibition? TE: As an artist I am interested in the relationship between machines and humans. The principle concern of my practice is how our view of life is increasingly mediated by machines and the digital as a shaping condition and structuring paradox. The question of whether we live in a real world or a simulated or virtual one has plagued philosophers for centuries. As an artist I realized that a lot of people never see my work in real time and space but instead see it in a virtual context- online in albums or blogs or websites. So the creation of a photograph rather than an installation was in anticipation of how people often see the work in promotional material. I think people don’t read a lot of text anymore and can miss a lot. So some people might see the image and think that it was an actual installation in the physical space rather than a photographic image. But the work exhibited was not the installation but instead a digital photograph taken during the formation of an art installation. And it was presented in Venice as a digital display. So for me showing the work as an installation is not important. And showing this work in a physical context is actually not so important to me either, because for me it exists very much online. But there is also interplay between the real space and the virtual space and I have to maintain that connection between the real and the cyber, I suppose. AF: Overlords develops from your previous work Blitz, that was exhibited at The New Art Gallery Walsall in 2009, as a time-based installation. Could you tell us how you went from Blitz to an intentionally unrealized project? TE: When I first started working in this way, I did two versions of the same work because I was still playing with ideas of presentation. One I called Storm and the other one Blitz. Storm was the video version and Blitz was the photographic version. At the time I was looking at the Internet, especially things like Facebook, and how I was interacting with other people on the web. I’ve noticed that if you share something that has a tiny bit of text and a picture, loads and loads of people will ‘like’ it. But if you put a really fascinating article, you get only two likes. Then I started to think about art as a form of communication and its relationship to the audience. The fact is far more people were seeing my work online than they were in reality. And I thought, ‘Well, if that’s the system don’t fight it. Work with that.’ So I was deciding between making this work as a video or as a photograph, and at the end I decided to go with the photograph, because a photograph is more immediate and takes less time to be experienced. It’s not exactly Internet Art, because Internet Art is designed to be on the internet and very clearly exists only on the Internet. In my work there is kind of playing between the two. So I guess some would call it virtual but virtual space is very obviously different from real space. It’s the joining and overlapping of the real and the virtual that distinguishes my practice, I suppose. AF: Does the work consists of one photograph or is it a series? TE: It’s a series of photographs. There are several different ones, several different versions. I take hundreds of photographs and then I go through them all and I select the ones that are any good. Sometimes it’s difficult to get it right. And sometimes it just doesn’t look right. So you have to make a lot of mistakes in order to have things that work. AF: So, does it change depending on when and where you are showing it? Do you change the selection of pictures depending on the project you are participating to? Or is there a final and official version, a selection of pictures you are sticking to? TE: I do believe that context is very important. Generally, what I try to do is to use one picture rather than creating a series. I think that when you are putting images in a series it confuses the issue and the emphasis goes beyond the single image. If I have a show, I prefer to put in one image only. For instance, when I showed Overlords in Venice, there was a very particular image that I used which I thought somehow worked very well. The Venice Biennale is a very funny place because you have all this very contemporary work in this very traditional setting. It’s strange – there is a sort of competition going, because Venice is gorgeous and a lot of contemporary art isn’t necessarily as aesthetically minded as the art of the past. I wanted to try to bridge this gap, something that could work well in Venice. And so I selected the image based on that. EA: Did you chose a different picture for the Basel exhibition? TE: Yes, that was a slightly different image. EA: Finally, I want to talk more about the difference between the initial intention that you had for Overlords and the final result. Could you to tell us more about the process that led you from the original idea to the final work? TE: I had a big studio in Hackney (London) where I filmed part of Archive Fever. But the rent was going through the roof. I began to realize that I was paying huge overheads in order to make work. Around 2008 is when I began to seriously think about changing my practice. But of course it was a natural progression as I was already looking at how our lives were dictated by film, television, mobile phones and computers. That’s when I started to develop the photographic work I am currently doing and I also started to do much more performance that also revolves around the same issues. But that small alteration changed everything about how I work, where I work and even in terms of archiving my art. I mean how many artists do we all know who have stacks and stacks of paintings that probably end up unsold? I’ve been to car-boots sales and it’s always a depressing thing, especially if it’s an unknown artist who has died. A lot of times their work is just sold for a pound or less, and then whatever isn’t sold goes to the rubbish bin. It’s so sad because you know that this person spent his or her whole life building up this work. In a sense, it’s much easier to archive something that is digital. I do have an archive which consists of stacks and stacks of discs. And I’ve archived all the photos I’ve taken, and not just the best ones, I keep them all. Of course the problem is that technology changes. Right now, laptops don’t have a disc reader anymore. So I’m going to have to think of changing all of this to store onto another format.